You may have known I really hate my broadband speeds. 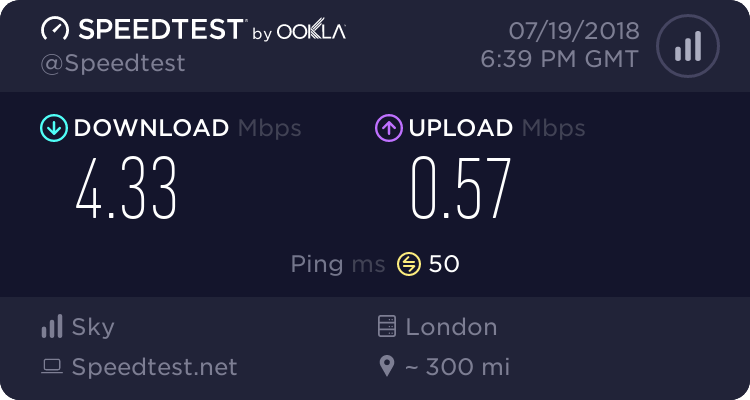 I’ve replaced the ADSL filters, the phone extension coil and the router, and was still getting barely 1Mb on a 4Mb connection from Sky. The only cable I hadn’t yet replaced was the cable that went from my router to the extension coil. Without hoping for much, I spent £2 and got a “high quality” (always be careful with any listing that says that) so I decided to buy two while I was at it. It arrived and I swapped out the cable. Then tested it. The router claims connection speed as 7007 kbps down and 921 kbps up. An improvement over barely 1Mbps, but still below the 7007 kbps down claimed by the router….